Fishmongers inspect bluefin tuna at Tokyo’s Tsukiji fish market on January 5, 2013. Asia-Pacific fishing nations and territories agreed on Thursday to cut catches of young bluefin tuna by 15%, with an agreement environmentalists said would not stop overfishing. 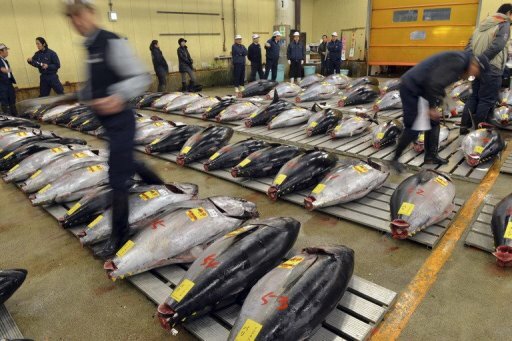 TOKYO (AFP) – (AFP) – Asia-Pacific fishing nations and territories agreed on Thursday to cut catches of young bluefin tuna by 15 percent, with an agreement environmentalists said would not stop overfishing. Nine economies, including the United States, China, South Korea and Taiwan, concluded a four-day meeting of the Western and Central Pacific Fisheries Commission (WCPFC) in Fukuoka, western Japan. The participants agreed to reduce the amount of bluefin tuna aged three years or younger in 2014 by 15 percent of the average between 2002 and 2004, a Japanese fisheries agency official said. The United States had proposed a 25-percent reduction, but a majority of participants, concerned about the impact on local fishing industries, agreed on the 15-percent cut proposed by Japan, the official said. The accord will be endorsed at the commission’s annual assembly in December in Australia, the official added. Greenpeace immediately denounced the reduction, saying only a total ban on catching bluefin tuna — at least until a sign of clear recovery of the species can be confirmed — was enough. Greenpeace also called on Japan — the world’s biggest consumer of tuna — to take the lead in adopting effective measures “to assure the sustainability of fishing bluefin tuna in the Pacific”. Environmentalists say industrial-scale fishing that takes large amounts of young tuna from the ocean before they are old enough to breed is destroying the population of a fish highly-prized in Japan’s sushi restaurants. The WCPFC was formed in 2004 based on a UN treaty to conserve and manage tuna and other highly migratory fish stocks across the western and central areas of the Pacific.